The other rule change I found interesting is that a ball carrier can no longer be tripped - in my 31 years of officiating, rarely saw it but NFHS rules side greatly on safety. On a side note, football is also experiencing a shortage of officials and we have a recruitment committee that is looking at attracting new prospects. Could you help us out to reach out to your readers? You bet my man. Considered it shared. And when we get closer to the clinics and sign-up times, remind us again. Because we talk about the number issues facing football — skyrocketing insurance rates, declining numbers of players, etc. — high school football without referees, well, you no what that means. 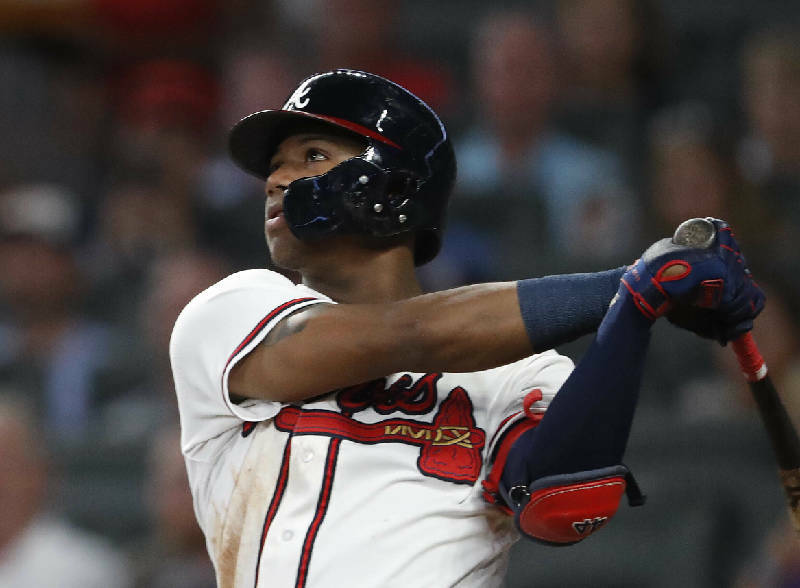 After being named the National League's top rookie last season, Atlanta Braves outfielder Ronald Acuna Jr. will try to help the team enjoy even more success this season. Braves pitchers and catchers report for spring training in Florida next Saturday. I heard the Braves announcer on Press Row and wondered what you think about what he had to say and what us Braves fans can expect? Thanks for making the ride home entertaining. It's our pleasure, for sure, and you big-brained guys and gals that listen and play along with the silliness make it a ton of fun for us too. I thought Ben Ingram was excellent on Press Row on Wednesday. The biggest single word of the week was when asked to describe the Braves offseason, Ingram — who is employed by the Braves, remember — used the word "disappointing." I am holding out hope that the Braves still have one more move left because, despite talking like they were going to be big spenders, adding Josh Donaldson, Brian McCann and retread Nick Markakis does not feel like an offseason of big spending. And it completely ignored the glaring issue with this bunch. There is no bona fide, top-of-the-rotation ace, and without that, this team may contend and may even get into the playoffs, but they will be limited in October without a legit No. 1. And for those of you who are regulars around these parts, there is no baseball truth with more truth than it doesn't really matter until the 'er' months. Jay, did you see Bill Barnwell's article that the Rams should not extend Jared Goff's contract? Haven't you been saying that for like a year? I think it's crazy to be honest because without a quarterback you have no chance in the NFL. Thanks for the letter and I have been saying that about Goff and several other young quarterbacks. Why can't quarterbacks become the next generation of running backs, especially if more and more systems put the quarterback in harm's way by running the football? If you are Sean McVay and you believe in your offensive genius and your system, absolutely roll the dice on your skill set. That's extreme value in a hyper-competitive league that is always looking for a competitive edge and a sliver of value. And the numbers point the success more to McVay (and even a healthy Todd Gurley) than Goff being the prototypical franchise QB. 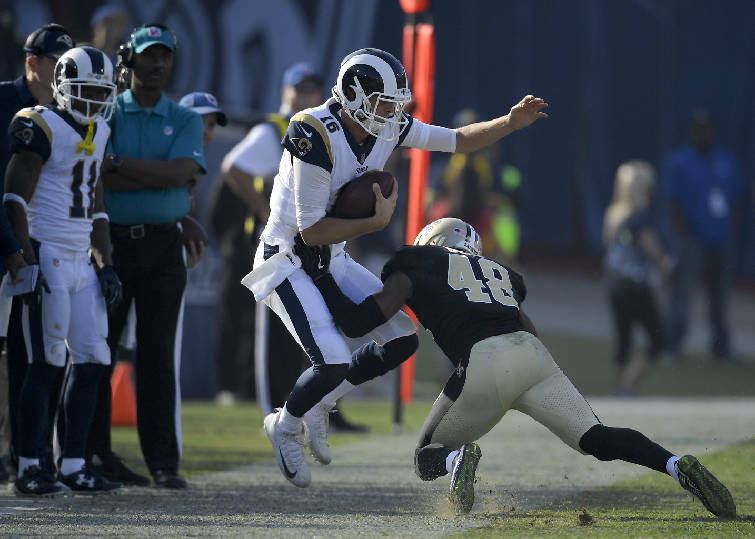 So, if you are the Rams, why not draft a quarterback high — first or second round — and instead of paying Goff $25 million (the going rate for most starters) you recycle the position and keep those dudes like Gurley, Donald and Whitworth and have a complete roster. One of the reasons teams do not do this is because of tradition. Another is because it's the easy way out. It's easier to extend an above average quarterback and not be second-guessed if/when the replacement does not work out. But ask yourself this: How has that worked out for Detroit, which has extended Matt Stafford and is mired in muck. Of the top-10 highest paid players in the NFL in 2018, seven of them were quarterbacks, and five of those seven missed the playoffs. The two of those that did are all-timers in Drew Brees and Tom Brady, so they are assuredly worth that portion of the salary cap hit. The other five — Rodgers, Ryan, Jimmy GQ, Alex Smith and Kirk Cousins — consumed such a part of the cap that the lack of depth or roster holes spelled doom. For what it's worth, of the other three players in the top 10, two of them were defensive studs — Khalil Mack and Aaron Donald — that had monster years for teams with QBs on rookie deals and the other was Odell Beckham Jr.
Hey Jay, I love your work. 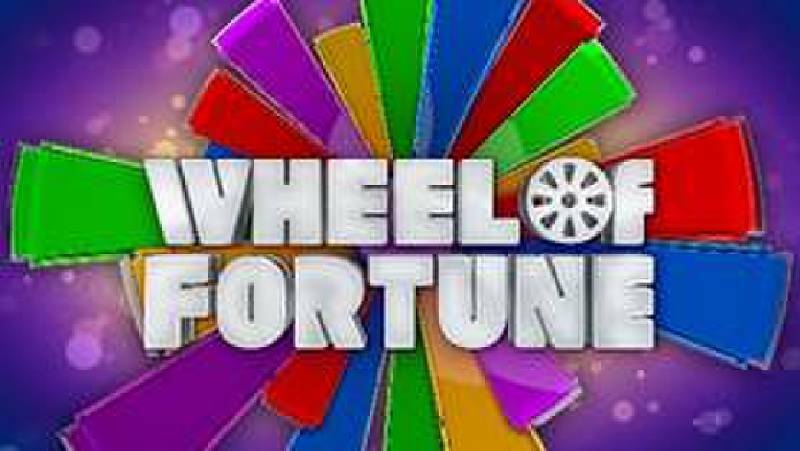 Did you happen to see the Ooltewah couple on Wheel of Fortune (Thursday)? How did they do? What gameshow would you be the best at and what makes your Rushmore of all-time gameshows? I did see the story of Travis and Bethany Goccia. As for all-time Rushmore, well, we have to divide that a little bit. All-time game show Rushmore, in terms of greatness: Price is Right, Jeopardy!, Wheel of Fortune and Family Feud. The Rushmore of game shows, in terms of campy silliness and ones that make me stop when scanning the GameShow Network (an underrated channel for sure): Newlywed Game, Jokers Wild, Press Your Luck and Card Sharks. Which brings us to this week's Rushmores. Enjoy. Rushmore of 'K': Dr. K, Coach K, Specil K with Red Berries and K (what I call my wife Kathleen). If you need one more as a sub there, let's go with "Every kiss begins with Kay" — the Christmas catch phrase that consumes the TV. Rushmore of presidential nicknames: The Father of our Country has to be there right? Old Rough and Ready for Zachary Taylor (the nickname was better than his presidency according to most), Silent Cal (and while we loved Spy's story about the little boy's bet, how about this great line from the New York Times about Silent Cal, "Every time he opened his mouth a moth flew out.") and The Gipper. (And note we went with the good and accurate rather than the derogatory. Rushmore of SNL impersonations: Tina Fey as Sarah Palin; Dana Carvey as H.W. Bush (and Carvey would be back on SNL if Gov. Haslam runs for President — spitting images of each other) Alec Baldwin's Trump and Will Ferrell's W if for no other reason than the classic "Strategee-ry. It does seem like sooner or later these mid-level schools that are getting the sanctions will at some point try to make sure the big boys get caught too. The NCAA and ESPN and any other money maker do not want Alabama and UGA and Clemson to get in trouble but the Ole Miss's and Missouri's of the world will get sick and tired of being the ones to pay the price. Like I said, so many layers. Yes, Jules, there are a slew of levels. But the most important phrase you used was 'money maker' and it applies to the big boys in basketball and football. Consider the lack of noise or stick when an issue comes from Tuscaloosa. Consider the complete nothing that emerged from Chapel Hill. Want to know why? Because a college football season without Alabama being eligible to win it all is not a real college football season currently. And a college basketball tournament without UNC or Duke is not a tournament. Yes, March Madness is great because of the David vs. Goliath storyline early, but when the second weekend arrives, we all want enough Goliaths around to still be interested. Yes, this only applies to the legitimate elite — both in terms of current talent and overall tradition — but it certainly applies. And while the other schools may be bothered by this, they are willing to accept it more times than not because the checks every May are that big and that important. The NCAA has no intent to investigate basketball unless it absolutely has to because the tournament pays all the NCAA bills. And the NCAA is scared to really investigate football because it does not want to run the risk of forcing the Power 5 to breakaway because an NCAA tournament without the Power 5 is relatively worthless over the long haul. J, how long before the NFL goes the route of MLB and gives football players a route other than NCAA to get into the league? If at least one of these "minor league systems" has some success, do you think that starts becoming a conversation? But we think the key for these leagues to stick around is to find a way to connect as the direct feeder system to the league, and we believe college football and the AAF or the XFL can co-exist. The PPF, however, is going to actively recruit 18-year-old five stars who may not have any interest in going to college. So there's that. And yes, I think that could be a very interesting conversation. Now, the extra advantage of the NFL having a direct connection with one of these leagues as a feeder system is that they can dictate what systems they run — pro style rather than spread option for example — that can enhance to development of QBs and OLs. Do you think (the AAF) would get better attendance, tv ratings, etc. If they set up everything like college football? Not really, because the connection of college football to its fans is so based in tradition that it would be tough to emulate. That said, we think the idea of having territorial draft rights to players. Meaning that most Alabama and Auburn players will be allocated to Birmingham. In fact, we believe that as much experimenting as possible will help separate the leagues and behoove the value of that league to the NFL, which is the key to survival. 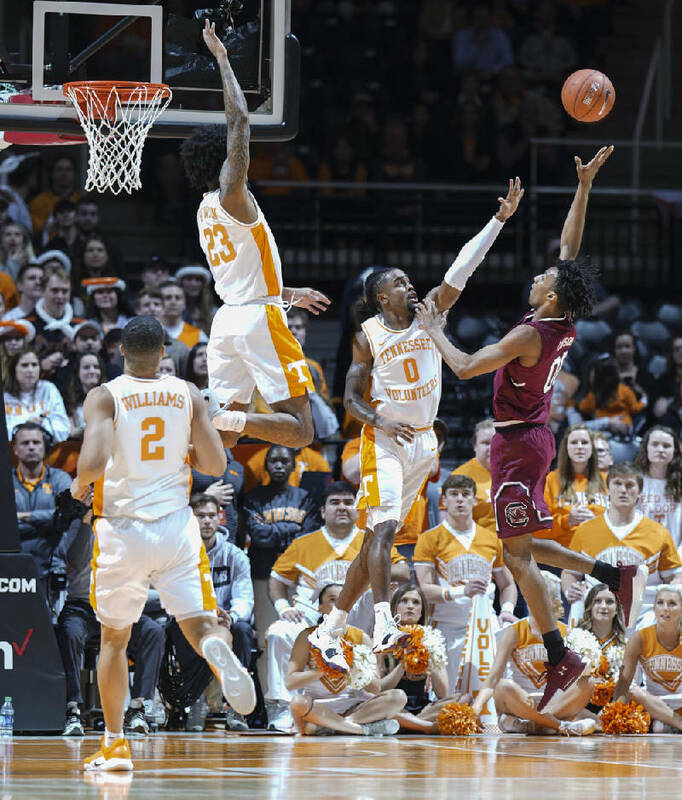 Tennessee's Jordan Bowden (23) and Jordan Bone (0) get in South Carolina's A.J. Lawson face as he shoots during Wednesday night's game in Knoxville. Tennessee won 85-73, its 19th straight victory. By Friday we will know the results of the UT SC basketball game. How about breaking down the UT KY game? Is KY motivated by the loss to LSU? Does TN learn anything from what LSU did against KY? Same for KY based on the game results tonight. Also, if Vols win Sat., which is a big if, does Calipari storm off the court in a huff again without shaking hands with the opponents? Looked like 23,000 shocked fans standing around waiting for the refs to return last night after the LSU win at Rupp. Keep up the good work. The lines for Saturday's games have not been posted as of this morning on VegasInsider.com so we will post Saturday picks a little later. I do not think the loss to LSU affects this game in the slightest way possible. In fact, if it did have any type of impact, it actually helps Tennessee in that a) it shows that UK is getable in Rupp and b) if UT starts fast, the home crowd is going to get antsy. We have said multiple times that John Calipari is an underrated X-and-O coach, and we firmly believe he has something up his sleeve. In fact we expect him to try to hammer the Vols inside and make Grant Williams work on the defensive end against the huge Wildcats front court. We expect UT to play exceedingly well because of its experience and demeanor, the latter is arguably Rick Barnes' most valuable creation on this bunch. It's hard to recall a team with this much talent and this mooch focus. If pressed we would say this is the best combo of those two since the Hansborough UNC team that steamrolled everyone in March and April. As Chas will likely (and accurately) point out too, we think this game will be decided by the point guards. Simply put, who handles the pressure and moment better — Jordan Bone or Ashton Hagans? Also of note, it's impossible not to like the games of Tyler Herro and Admiral Schofield, and if you merged their names, wouldn't Admiral Herro be arguably the greatest name in history? I know two things about this game ultimately. I will watch every minute of it, and these are two of the best three teams in the country, regardless of what happened against LSU.